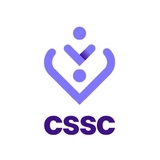 2019 is shaping up to be a big year for CSSC, with the launch of our new website, which will improve the online experience for members and provide easy access to benefits and events. Mark your calendar for this year’s Games which will take place in September and start thinking about creative ways to prepare your workplace for Active Wellbeing Week in July. 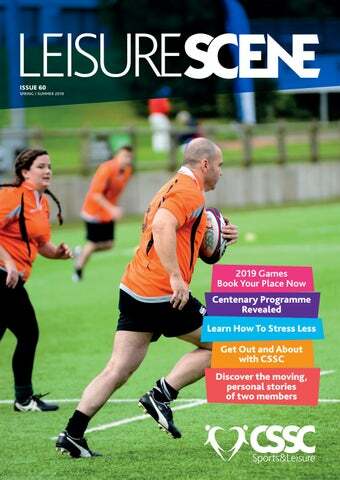 In this issue, we’re looking at the causes, symptoms and ways to beat stress for national Stress Awareness Month and revealing some of the major events scheduled for CSSC’s centenary programme in 2021. Keep up to date with all the news, events, posts and competitions as they happen. If you change your job, retire or leave the civil service or public sector, remember that you can retain your CSSC membership. If you have moved work location or home address, remember to let our customer support team know so that all information is sent to your correct address. Publication of advertisements does not imply any form of recommendation. CSSC Sports & Leisure accepts no responsibility for any statements in advertisements. Each advertisement is inserted on the distinct understanding that no advantage will accrue to the advertiser in relation to its business dealing with CSSC Sports & Leisure. Leisure Scene can be made available in alternative formats on request. Environmental: Leisure Scene is 100% recyclable. The pulp used is bleached without the use of chlorine and is from a mill using an environmental management system approved according to ISO 14001 and EMAS. The polywrap in which Leisure Scene is posted is 100% biodegradable. With approximately 1,500 volunteers, the success of our organisation is built on the hard work and tireless efforts of our volunteers who are responsible for the delivery of a substantial proportion of our members benefits. With new and exciting events and opportunities on offer throughout the year, we’d like to think that we’re continuing to keep pace with our vibrant member and volunteer communities. The AGM is open to all subscribing CSSC members, who may attend at their own cost. PLEASE BRING A FORM OF ID WITH YOU. 2018 was a record year for usage of CSSC’s benefits by our members. When you become a member of CSSC, you’re signing up to an organisation that prides itself on a progressive approach. We work hard to keep up with industry standards not only in terms of what we offer but how we offer it to our members. What to expect during the week? Join CSSC and Civil Service Employee Policy (CSEP) for the nationwide Active Wellbeing Week. •	A nationwide ‘pledging’ campaign, encouraging individuals to make a personal pledge on how they intend to be more active. Active Wellbeing Week aims to help change the lives of thousands of civil service and public sector employees by encouraging a healthier, more active lifestyle. •	Online and physical packs of tools and resources to help individuals and workplaces get involved during the week and beyond. •	Daily prize draws. •	Events across the UK. Answer these questions to be in with a chance of winning vouchers from a retailer* of your choice. You’ll find all the answers in this issue of Leisure Scene. True or False: Fencing is one of the activities on offer at the 2019 Games? If customer support team leader Jade Anderson had to be a pair of shoes, what would she be? On what date was CSSC formed? How many trips do the CSSC hillwalkers do each year? During what week is it time to make your move with Active Wellbeing Week? together with your choice of retailer. *Depending on availability from retailer. From 1 April 2019 the scheme is available to members aged 50 to 74. •	Full Worldwide Cover •	No Medical Screening Information required •	No limit to the number of journeys • Any single trip can last for up to 65 days (45 days in USA, Canada, Caribbean) • Winter Sports Cover up to 17 days The scheme is only available to members who are residents of the United Kingdom. Want to enter a team sport but you’re not part of a team, or not sure you’ll have a full team to enter? Get in touch with the events team at csscgames@cssc.co.uk and we’ll do all we can to match part entries so you can participate. Fancy being a superhero or villian? Join us on Friday night at Loughborough Student Union for fantastic entertainment, get a team picture taken in the photo booth and win prizes for the best fancy dress. Entertainment has also been planned for Thursday evening at the Student Union. There’ll also be a quiet bar available on both the Thursday and Friday evenings at the residents village. Fancy dress optional! All events will take place on the Friday, except those marked with * which begin on Thursday at 12.00.
LEISURE Join us for some fun competition. Whatever your sporting ability there is an event for you! £20.00 supplement for those participating in golf £30.00 supplement for those participating in karting Financial help is available! We are also launching our new events system allowing you to book and pay for events online. Email addresses Your email address is the key to login to the website and access all the great benefits on offer. When you call CSSC you’re greeted by our friendly team of customer support advisors. Have you ever wanted to see who’s on the other end of the phone? Find out who’s taking your calls, and what the most common questions are. C My CSSC card isn’t accepted at the supermarket, how do I get the shopping discounts you told me about? If Sandra Jeffries was an inanimate object for a year, she’d be a TV and if she could speak only one word for the week it would be ‘love’. She’s often asked: I’ve moved house and/or QC employer, how do I update my details? Can my husband/wife/partner use my QC CSSC membership to take the family to visit English Heritage sites without me being there? C I’d like to visit the Historic Royal Palaces. How many people can I take and what do I need? I’ve lost my membership card; how do I get a new one? Login to cssc.co.uk and complete our online membership card request form which you will find in the ‘My CSSC/My Account’ page. You’ll then receive an email containing your digital membership card within 2 working days. Cadw sites allow you to bring friends and family along, the person named on the membership card needs to be there too. Photo ID of the member is required. In a recent survey, the Mental Health Foundation reported that 74% of UK adults have felt so stressed at some point over the last year they felt overwhelmed or unable to cope. “Individually we need to understand what is causing us personal stress” says director of the foundation Isabell Goldi, “and learn what steps we can take to reduce it for ourselves and those around us.” While stress isn’t a mental health problem in itself, it can lead to depression, anxiety and physical health problems like cardiovascular disease, digestive, joint and muscle problems. How to Spot Stress: Scott Laidler, a personal trainer and development coach says that these are some of the signs to look out for; PHYSICAL: a pounding heart, elevated blood pressure, sweaty palms, tightness of chest, aching neck, jaw and back muscles, headache, chest pains, abdominal cramps, nausea, trembling, sleep disturbance, tiredness, susceptibility to minor illness, itching, being easily startled, forgetfulness. MENTAL: your mind racing or going blank, not being able to ‘switch off’, a lack of attention to detail, lack of self-esteem and confidence, disorganised thoughts, a diminished sense of meaning in life, a lack of control or the need for too much control, negative self-statements and negative evaluation, difficulty in making decisions, a loss of perspective. BEHAVIOURAL: becoming withdrawn and not wanting to socialise, increasing your alcohol, nicotine or drugs intake, under or over eating, becoming accident prone and careless, becoming impatient, aggressive or compulsive, managing time poorly and losing out on leisure activities. FEELINGS: irritable, angry, depressed, jealous, restless, anxious, hyper alert, unnecessarily guilty, panic, mood swings, crying easily. The number one tip to fighting stress is exercise. It won’t make your problems disappear, but getting regular exercise will help clear your head, freshen your perspective. Feelings of powerlessness are one of the main contributors to stress, so try turning a passive mind-set into an active mind-set by turning your ‘problems’ into ‘challenges’, and take positive steps to find solutions. “Accept the things you cannot change” is good advice when it comes to stress. The Buddhist philosophy that suffering = pain x resistance demonstrates how acceptance causes less suffering than struggling vainly against it – whether it’s small daily things like accepting that your inbox will always have unread emails, or big things like dealing with the loss of a loved one or a health issue. a friend, practice a relaxation technique and get away from your desk for lunch. These things will help you relax and recharge and be more, not less, productive. Bad habits only exacerbate the effects of stress. Instead, turn your attention elsewhere during times of stress and you’ll likely ride it out without making things worse. Connecting with friends and family is an excellent way to help manage stress. Turn to the people you trust and ask for help whether it’s having a chat over coffee or enjoying an activity together, evidence proves that good relationships make us stronger and keep us healthier in mind and body. Professor Cary Cooper, an occupational health expert at the University of Lancaster explains that people who help others, through activities such as volunteering or community work, become more resilient and maintain a better perspective about their own problems. CSSC’s centenary will seek to capture the imagination of our members, volunteers and partners. It will be a means of promoting CSSC and encouraging ideas for the future. Our centenary celebrations will begin in March 2021 in Westminster, with a musical celebration featuring the Whitehall Orchestra and the Etcetera Choir. Volunteers from across CSSC will then transport a time capsule in a relay around the country to embrace our many affiliated associations, sports events and CSSC locations. Centenary reception CSSC’s centenary reception will be held in the George Thomas Room in Central Hall, Westminster; the very room that CSSC’s inaugural meeting took place in on 4 November 1921. So on 4 November 2021, we will host a reception to celebrate the formation meeting and the return of the centenary relay after its journey around the country. The time capsule, containing key items from CSSC’s history, will then be displayed permanently in the George Thomas Room. In September 2021, a volunteer reception will be held at Kensington Palace in the presence of HRH The Duchess of Gloucester. Inter departmental sport event The Duke of York Trophy was introduced in 1924 for inter departmental sport and will play a key part in the centenary celebrations. CSSC centenary games The CSSC Games 2021 will be a showcase event for CSSC sport and physical activity, reaching out to all parts of the membership. The Civil Service Athletics Association, an association with a long and illustrious history dating back to 1864, will manage a CSSC Centenary 5k Challenge series in London, the Midlands and in the North of England, Scotland and Wales. In a leaflet commemorating CSSC’s coming of age in 1942, several references to Sir Noel Curtis Bennett (CB) appear including the following from HRH The Duke of Gloucester KG: “To have reached 21 years and to have achieved so much for all grades of HM Civil Service is a fine record and one of which the Council and especially its founder, Sir Noel Curtis Bennett has every right to be proud”. All affiliated associations and clubs will be encouraged to participate in this event in 2021 in recognition of CB’s role in founding CSSC. LEISURE with fellow runners and friendships grew as a result. “They became a support network that I have relied on several times over the years” says Sue. While she’s had a turn at scanning barcodes, marshalling, taking photos and guiding visually-impaired runners amongst many other roles. Sue’s favourite task is pacing; wearing a bib with a specific number that denotes average pace, which helps other runners to achieve their personal best. Recently, Sue fulfilled a dream of running with her partner, her daughter-in-law and both of her sons for her 55th birthday, “the crowning event to celebrate life.” Whether it’s around a lake, up a hill, along the beach or on tarmac, gravel or grass - parkrun aims to have a free, timed, weekly event in every community that wants one. Last year, however, everything changed for Sue. She fell into a life-threatening episode of sudden and deep depression and had to take six months off work. During that time, her parkrun friends rallied round and supported her; taking time out in the week to encourage Sue out for a run or a walk. with your CSSC membership number. Then register on the parkrun website and select ‘CSSC Sports and Leisure’ as your parkrun running club. ALL THE MORE REASON TO COMPLETE A PARKRUN EVERY SATURDAY! “I always loved swimming as a child and have re-discovered my love for it through these swimming challenges and exercising in general where I can.” This is the second year Rachel has taken on the annual Swim 22 Challenge, and while it’s an impressive feat of strength and commitment in its own right, for Rachel, this is even truer because she suffers from Lymphoedema. Lymphoedema is a progressive condition that affects both of Rachel’s legs, causing them to become swollen with excessive fluids that her lymphatic system cannot process efficiently. It runs in families and can be triggered by surgery, inflammation, disease and infection and for Rachel, it began after a minor accident. LEISURE Raising money for Diabetes UK, Rachel carried out her swim in a pool completing a total of 1,465 lengths over a three-month period. more weight, reducing her weight by almost 70kg in total, which helped her to reverse her diabetes diagnosis and improve her Lymphedema condition considerably. Rachel received a £200 subsidy from CSSC’s sponsorship scheme to take part in the Swim 22 Challenge, and used the opportunity to raise money for Diabetes UK to increase awareness of the condition that affects a number of Rachel’s family members. If there’s a challenge or event you’d like some help with, get in touch with CSSC and find out how we can financially assist you through our sponsorship scheme. If you love to play sport and enjoy a bit of friendly competition, sign up to take part in one of CSSC’s sporting events today. Whether it’s beating a personal best or simply the fun of playing as a team, signing up to play a sport will give you the chance to challenge yourself, make friends and build confidence. Hillwalking Join our very welcoming community of hillwalkers on one of their six adventures around the UK taking in glorious scenery and terrains. All standards of walkers are welcomed. Angling Take part in our regional boat, coarse, game and shore angling events and you could qualify to compete in one of our four national finals. Alternatively, you can join our open events in pike and shore angling, which anybody can enter, no matter what levels of experience you have. Bowls Play bowls your way, with three different varieties to choose from; indoor bowls, flat green bowls and crown green bowls. Our indoor and crown green are national finals which means you need to qualify to compete whereas the flat green is an open event, catering for all abilities. Target shooting Take aim and fire in CSSC’s open championships, including competitions in target rifles, short range and long range amongst others. The annual championships are staged at the prestigious Bisley Shooting grounds. Cricket Grab your whites and join our 11-a-side national open competition, open to both men and women, to compete for the Curtis Bennett Shield. Volleyball Whether you love the sun and sand or prefer more solid ground, get your volleyball fix at the indoor and beach volleyball open championships. Teams can be women’s, men’s or mixed. Join the fun and enter a team into either of the championships. Squash Get ready to squash your opponent with CSSC singles, masters and team competitions, open to everyone. There is also a racketball open tournament. Swimming We welcome all standards of swimmers and divers to our open championships and for those who want to brave the elements, an open water swim is also an option. Pilates classes at IOPC CSSC understands the difficulties and financial risk of setting up a new activity at work. We’re here to help your workplace get active. The Independent Office of Police Conduct in Wakefield were awarded £250 to help pay an instructor for a new lunchtime Pilates class. The initiative was implemented to bring colleagues together socially and to help them experience some of the proven benefits of Pilates including improved stability, flexibility, posture and strength. Everyone loved the classes even though most had never tried Pilates before. CSSC’s physical activity fund played a big role in helping the staff implement the trial. Now that people have had the opportunity to experience the positive results of Pilates, many have said they would try it again and found it beneficial to their fitness, back strain and tension. Whether it’s a brisk walk around the park at lunch or a fitness class after work, exercise is a great way to relieve any work stress. Here’s what some of our members are doing to shake off the tension. LEISURE CSSC’s physical activity fund isn’t always about starting a class or testing the water for a new activity. The team at Worsley Job Centre Plus asked CSSC for help buying a table If you feel inspired to organise an activity in your workplace get in touch and apply today. tennis table in their conference room in the hope that it would provide a fun way for their staff to let off some steam during the working day and get some light activity. The reaction has been overwhelmingly positive, with many admitting they haven’t played since secondary school, agreeing that it provides an excellent opportunity to take a break from the computer screen and a welcome strategy to alleviate stress. No matter your level of ability or your rank within the office, the table tennis table is available to everyone, proving to be a smash hit with all Worsley Job Centre Plus staff; even the senior managers attending meetings in the conference room have been spotted playing table tennis. Theme Parks Whether you have little ones who love the slow rides, teens who want to take it to the limit or you love the thrilling twists and turns of a roller coaster, CSSC membership gets you incredible discounts at your favourite theme parks across the UK. Wildlife There’s nothing quite like seeing the world’s most fierce and exotic creatures in the flesh. With discounts to many of Britain’s favourite zoos and aquariums you can walk through shark tunnels and explore coral caves, or see the animals of the safari and walk beside wild wolves. guaranteed to get you off the sofa. or take a thrill ride with the kids at a theme park. and towers escape into life with CSSC. Play Tourist Is there a national treasure in your neighbourhood that you havenâ&#x20AC;&#x2122;t visited yet? Be a tourist and explore the wonderful sites of Britain with a little help from CSSC. Membership gets you discounted entry to some of the most iconic sites of Britain. 27 Tickets are limited and subject to seasonal availability. Clay Pigeon Test your aim with a day of clay pigeon shooting at Martin Gorse Wood. A small, friendly and popular venue, the club is situated between Dover and Deal in the lovely Kentish countryside. With a variety of stands and a large sporting layout, you’ll never tire of your targets. White Water Rafting There’s gallons of fun to be had at Lee Valley White Water Centre, from white water rafting on the Olympic course to family paddling on our lake. Just an hour’s drive north of London, the Lee Valley White Water Centre caters for all ages and abilities. Track Cycling Take your cycling to the next level with an authentic velodrome experience at Lee Valley VeloPark’s indoor velodrome, the fastest track in the world. Everyone from beginners to elite riders are able to ride the track at this iconic venue on Queen Elizabeth Olympic Park. thing different, something unexpected, as a gateway to outdoor adventures, unique learning opportunities. Alpaca Treks Ever wanted to take an alpaca for a walk? Described as confidence-building and idyllic, CSSC members absolutely love this experience. So, weâ&#x20AC;&#x2122;ve made sure weâ&#x20AC;&#x2122;ve got a big range of alpaca walks and treks on offer across the UK from Peebleshire in Scotland and Aston Abbots in Oxfordshire to Wells-Next-the-Sea in Norfolk. Blacksmithing Learn the ancient art of blacksmithing with Adrian Wood of AW Artist Blacksmith. Situated in the rural outskirts of Yarm, in the heart of the Tees Valley, Adrian has been creating handcrafted forge work since 2004. The day is fully hands on; as well as learning the basic principles of blacksmithing, you will make up to three items to take home with you. LEISURE Help CSSC grow by signing up to become one of our office champions. Be our port-of-call in your department, spread the word among your colleagues and help others to achieve a more active, vibrant lifestyle both at work and home. yoana.petrica@cssc.co.uk to enquire about becoming an office champion or to arrange for one of our sales team to visit your office. PLUS FANTASTIC DISCOUNTS SUCH AS: UP TO 40% OFF BRITISH AIRWAYS FLIGHTS MR & MRS SMITH DISCOUNTS 75% OFF 2 AND 3 NIGHT SPA BREAKS AT CHAMPNEYS GET A DISCOUNTED WELLNESS CHECK & YOU CAN REDUCE YOUR INSURANCE PREMIUM EVERY YEAR!